Hi, I'm Cindy Birk Conley, from Carmi, Illinois. I took over as county co-ordinator in February, 2000, following Laurel Crook. She did a great job getting the site in shape, and I made few changes. My personal site is Cindy Birk Conley's Home Page which has several resources for White County and particularly my beloved Enfield. Only one of my grandparents, Frank Alma Savage, was born in White County, while his wife Harriet Lockwood moved to Illinois from Warrick County, IN--both of my father's parents were from Daviess Co. KY so I have interests in all three states. As a CPA, a board member of the Historical Society, and active in other local organizations, I never seem to have much time for research, but volunteers from the White County Historical Society will do work for you at a reasonable cost, and the funds will be used to expand the library and its services. I don't mind geographical questions, if you are looking for a current or historic community, church, cemetery, or school in the county, or questions about my families. In August 2012 I moved this site to a new server, but it's always going to be behind the net!! During 2018 Rootsweb/Ancestry had so much hacking that all their freepages were taken off the net, including our White County Historical Society page. I am trying to move it here https://white.illinoisgenweb.org/ilwcohsindex.htm. This is the most important page of our site. Even if you don't have a question, leave a note on the families you are researching. The first attempt of the genealogy library of the White County Historical Society to put information on line. Two large pages. Something new for 2015, adding the 1972 Survey of Tri-State Architecture, done by the Junior Historical Societies of Illinois, Indiana and Kentucky. A few years later the entries in the book formed the basis of properties eligible to be placed on the National Register for Historic Places, or at least the Illinois entries were. This meant that in 1985 and 1986 efforts to ignore the James Robert Williams home in Carmi, better known as the Castle, were not going to be successful. While the Castle is safe, many other properties, including those in Calvin, Enfield and Grayville have been lost to fire or neglect. These are large PDF files: Part 1, and Part 2. The book is about 40 pages. Freefind index to my site Maybe I have enough information on my site to warrant a search engine. Give it a try! If you are serious about genealogy, please try a database program. The LDS Church no longer supports PAF, their free program. I have used Rootsmagic (about $30), my favorite, for many years. It recently added a tablet or smartphone app. My new favorite website http://whiteil.mygisonline.com/ Everything you ever wanted to know about property in White County, Illinois. Carmi 1928-1935 on YouTube, Part 1. My cousin Lisa called me several years ago to see if I wanted to buy cans of film from the Williams estate. What a treasure. Carmi 1928-1935 on YouTube, Part 2. My thanks to Mark and Robin Johnson for getting the out-of-print DVD online. Biographies of prominent White Co. residents. Histories of early townships of White County. See Charlene's columns for Emma township and more. White County Historical Society and Mary Smith Fay Genealogy Library I maintain this site for now. Images of White County and Postcards of White County Pictures of places and people of White Co.
Obituaries of White County citizens. I have more to add, but many recent ones can be found from other links on this site. Tourism Bureau of IllinoiSouth https://www.illinoisouth.org/ which covers Southern Illinois from the Wabash to the Mississippi. The Carmi Times If you are serious about your White County research you should subscribe to the Weekly Times for about $30 per year and keep up on local news. Details on their site. There is an online edition as well. Volunteers are always needed! These are somewhat outdated. Saline, Wayne Not all of these work. To subscribe, send a message to [email protected] with "subscribe" (no quotes) in the body of the message. I'm not sure I know how to update the link properly in 2018. Database of marriages sponsored by the Secretary of State's office. White County Pensioners of 1883, transcribed by Dianna Williams of the Wayne County ILGenweb. The 5 volume listing of those receiving or applying for pensions helped me track my gggrandfather's widow to Texas, where she remarried for a time and lived with an adult daughter and her husband near a military base. Pension applications are worth the money. Dianna was a great help to me before her death at the end of 2016. An outline for researching families in White County. Some notes about prominent residents of the last 175 years. This page is a bit rough and there are many omissions of large families. White County Probate Indexes 1822-44 and 1843-1847 Our thanks to Carol Cyrus!! Pretty good stuff, but we could use more. The 1820 census is here, which never got proofread. Part of 1850 is on the census project. I'm not sure where this is right now. Cook Funeral Chapel Operates funeral homes in Carmi, Crossville and Grayville, the latter two previously owned by the Sturm family. .A Bible is an excellent source for finding out about your elusive great-great-grandmother when records were not kept for many females. Please send me your entries from your family Bible; it does not matter how big or small. Lots of good information about Enfield of today and yesterday. https://www.facebook.com/CarmiILL/?fb_dtsg_ag=AdxfevBniutzjAvENtzoDWazA55k4Ku5vPDu8B9NNEMoCg%3AAdxUYaxZ6rIXA6DX7YavyrCnQWhrHoR16GgCNvx0A-Yt0w The White County GenWeb Page on facebook. Please follow us, as social media is supposed to be the future. Revolutionary Soldiers of Southeastern Illinois I was DAR regent for 2011 to 2013. At the library in Carmi they have copied Kim Torp's transcription from Genealogytrails for other researchers. I found the same information on ancestry.com, and compared it to current DAR records. Wabash Chapter NSDAR A small site for the DAR chapter which represents White and Wayne counties, and has members who descended from local people. If you like genealogy check out DAR, SAR, Colonial Dames, 1812, and other lineage societes as a way to honor your ancestors, register your history, and work on patriotic activities. Every name index to 1883 White County History Our thanks to Cathy O'Connor for doing this index! You can find the book in many libraries and from interlibrary loan. The historical society has run out of reprints for sale. The Wayne County book is indexed, too, and the text has been digitized by what I think is the state library. Do a search if you are interested. I have the 1880s History of Daviess Co, KY on a CD, and find it to be very useful. Many folks have asked about a page on cemeteries. Back in the 1950s, a group read all the county cemeteries and published two books. A few cemeteries were re-read in 1986 by Ed Schuster, and he published the information. Around 2000 the historical society did several cemeteries, but only two townships were published before the project was put on the back burner. I would be happy to do look ups, but feel the future of cemetery research is at http://www.findagrave.com/index.html. Some local cemeteries have many listings, others almost none. Genealogy Trails for White County. Some good things, especially military. White County Probate records from FamilySearch, the LDS site. It looks like slow going with lots of images, but good information. There's lots to see on FamilySearch, but do be careful of undocumented family trees. You may need an account to see anything on this page. Campbell Funeral Home has obituaries online, with chapels in Carmi and Norris City. Stendeback Funeral Home has obituaries online. Has funeral homes in Carmi and Enfield, and had one in Norris City. Also owns a facility in Mt. Vernon, IN. The Enfield Horror One of a number of YouTube vidoes about the 1973 sighting of a Big Foot type monster. You'd be surprised how many emails I have gotten about the monster over the years. I have thought the creature came from ingesting too much of what the Irish call "the creature". Grayville Paddlefest A pretty good view of the Wabash from 2008 from YouTube. The paddlefest just seemed to be building and was discontinued. There are other videos about Grayville and the rest of the county on YouTube, several of the storms and flooding in 2011. 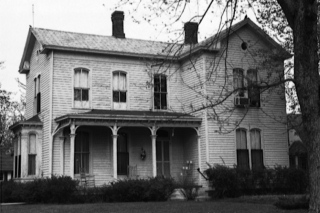 My house in 1972, from the IHPA listing of all National Register eligible properties. Probably too many changes since the fire in 1998 to get it listed. 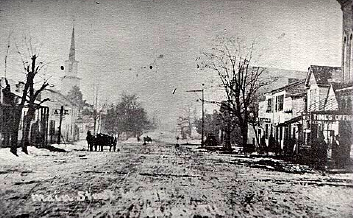 https://www.facebook.com/illinoiswcohs/?ref=br_rs White County Historical Society facebook page. Pretty active, recently Barry Cleveland has been sending me articles from his archives. Really good stuff. Thank you for visiting White County! Pray for America and the victims of terrorism! Copyright © by Laurel Crook and Cindy Birk Conley, all rights reserved. For personal use only. Commercial use of the information contained in these pages is strictly prohibited without prior permission. If copied, this copyright notice must appear with the information.